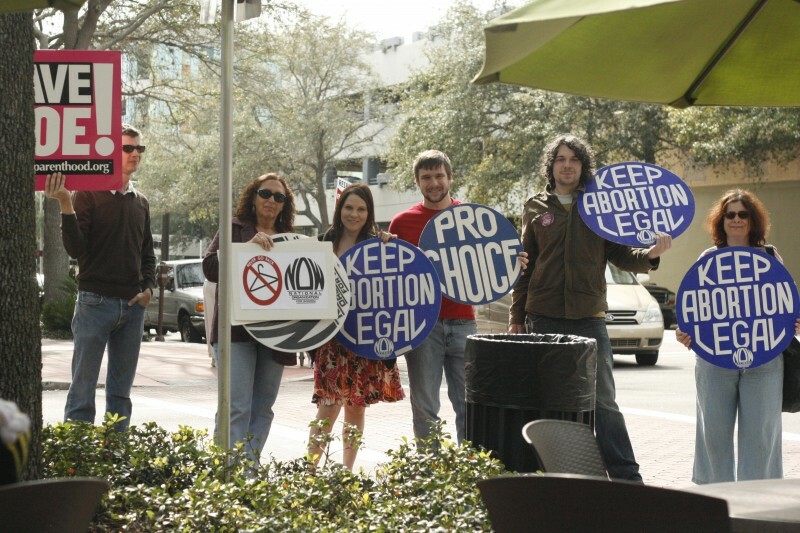 FL rallies for reproductive rights on Roe v. Wade anniversary | Fight Back! St. Petersburg, FL - More than 50 people gathered here, Jan. 22, to rally on the 40th anniversary of Roe V. Wade. Protesters gathered on a busy street corner to stand up for women's rights and access to safe healthcare. There were anti-choice demonstrators who showed up to counter-protest the event, but those present did not allow the anti-choicers to stifle their voice. Jan. 22 was a historic day in our country's history. It was the 40th anniversary of Roe V. Wade, the historic Supreme Court case that legalized abortion for women in this country. In the past 40 years, however, there have been many attacks on this landmark decision, with many states in the country taking steps to restrict access to comprehensive healthcare for women. Some states in the country, such as Mississippi, now have only one clinic that provides abortions for all the women of the state. Women who choose to receive services at these clinics are bombarded and harassed by the very same anti-choice demonstrators that were present at the rally in Saint Petersburg today. There were many organizations at the rally, which was organized by Planned Parenthood - Students for a Democratic Society, Dream Defenders, and the National Organization for Women (NOW) all showed up. Vivian Taylor, Vice-president of Pinellas County NOW, said of the event, “It is imperative that we recognize that abortion rights are workers' rights. The vast majority of abortions are had by working-class women. When access is restricted, women in impoverished areas suffer the most. The rhetoric of privacy rights has long outlived its usefulness. Abortion is a class issue." Seeing the people present at this event who braved the counter-demonstrators to take a stand for women's rights was truly inspiring and gives testament to the fact that the people will not give in to right-wing demands to give up women's reproductive rights. People are struggling in the streets and will continue to fight back as long as we need to stand up for women’s rights.